After measurements were taken, the next step was to plug in the transformer just for a quick test before mounting the lightbox on the wall. I did this and I was immediately impressed by the luminosity of the image. The color and contrast of the Milky Way looked quite good, pretty much matching the original image on my calibrated desktop screen. Now let me just stop to say that this image might be a particularly more difficult image to display properly as a print, due to the much greater contrast of the Milky Way and background sky, as well as any objects in the image. However, because I quickly chose the image for printing and the fact that it wasn't totally processed (a bit of a clipped histogram at the ends and little noise reduction in the shadows), I think it shows up very well in the frame. The shadow noise was a bit apparent when viewing the lit frame at reading distance, but on a wall several feet away, it will be well hidden. The big plus here, however, was the ability to send Stardust Gallery an original TIFF. That simple advantage, along with the fact that the image was printed on film, completely masked the fact that there were over and under saturated sections within the original image. I was not able to see the poorer processed sections at all, a welcome refresher from the standard snail mail or one hour jpeg services I am used to! The website offers a section where any high quality image can be uploaded. The owner, Craig, does have Photoshop and can manipulate images as needed-- a great convenience especially when we often have much differentiation among screen appearance and print. The lightbox was next to be mounted onto the wall. Since I lack the space for any new picture frames presently, I decided to remove an existing traditional picture from the wall and temporarily replace it with the lightbox for the purposes of this review. Since the wall then offered a hook once the picture was removed, I needed to find some galvanized wire to hook between the two d rings on back of the frame. Unfortunately, wire could not be found but, in a pinch, I had some fishing line handy to make the rear connections first. Once done and tested, I hung the picture on the wall and plugged it in. Once again, I noticed the great contrast of the image, along with brilliant luminosity, but color did seem a bit more bluish. It did not take long to find out the cause: the existing room lighting. I have basically switched to either LED lamps or "cool white" CFL's. In the case of the room where the picture was hung, a CFL as primary light. Once the CFL room light was turned off, the picture again became correctly color balanced. Just something to keep in mind, that existing room lighting may affect color balance of the backlit LED picture frame image. Easy solution is to replace room light with something more correctly color balanced. Keep in mind that the color balance issue likely wouldn't show in the case of a family or nature portrait as those types of images are much more forgiving to room lighting imbalances. · Ability to upload a high quality image directly via the Stardust Gallery website. 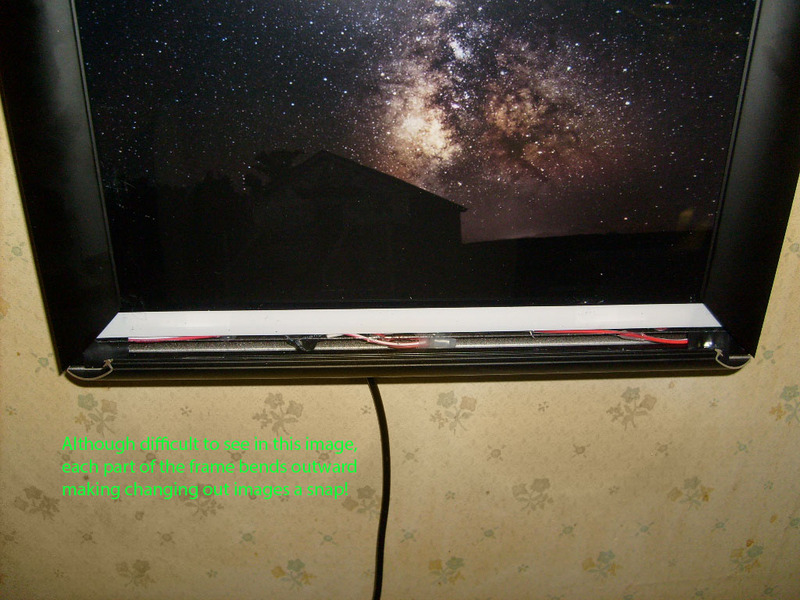 · Ability to utilize not only astronomy images, but any other types of images as well. Stardust Gallery uses a waterfall sample image, which would look great. I can think of rainbow or flower images as well. Don't forget about family portraits either! Keep in mind that Stardust Gallery offers options other than LED backlit lightboxes... you can simply receive a high quality metallic or glossy print, for example. · LED lightbox uses a high quality, all metal frame. · LED equates to long life, much longer than traditional incandescent or other bulbs. · Illumination of film really helps bring out image color and contrast. Combined with excellent LED backlighting, makes for an excellent image to show off on the wall! · Image can be changed out for another image at any time by opening the frame (the frame borders open outward). · Keep in mind that any small errors may show in result, the noise in shadows for example, but this is easily offset by careful processing beforehand and/or unlikely noticed at viewer distances once picture is mounted on the wall. 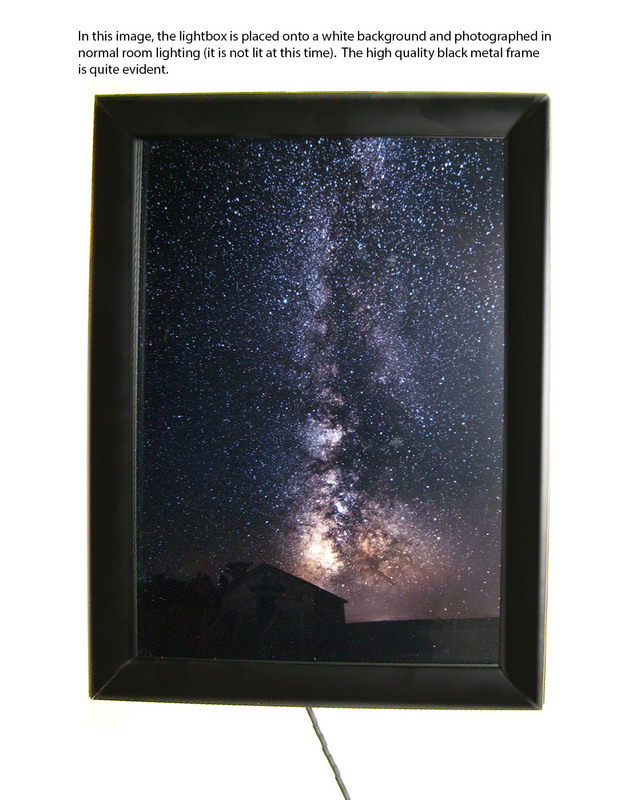 · It would be nice for Stardust Gallery to offer other materialistic options for lightboxes (wooden as an alternative frame, for example). 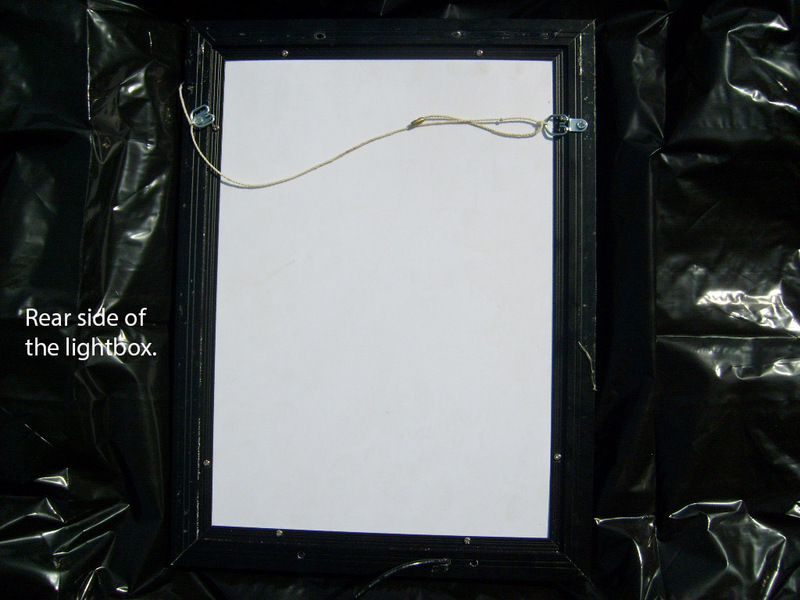 · A thinner power cord and/or alternate location emanation from the lightbox. · An ability to dim the LED brightness might be welcome as well as an on/off switch. · High quality, high contrast print. Color balance seems nearly identical to that of image viewed on calibrated monitor screen. · Printing paper seems high quality and not too thin as seen with some other firms. · Does not seem to hide shadow clipping as well as the film used for the Lightbox. Seems to substitute a slight amount of digital blocking for shadow clipping and noise. Note that this is only visible in very bright lighting and viewing the picture six inches away from the eyes. You'll not notice this six feet away on the wall!Most astro folks will have their images well corrected before printing (I didn't with mine) so these minor artifacts won't even be a factor. Stardust Gallery is located at stardustgallery.com. The website is well laid out and is easy to navigate. They are offering free shipping at this time. The FAQ spells out clear shipping, privacy, and return policies. There is no nonsense regarding contacting them either with address, email, and phone clearly written out on the "contact" page. In addition to offering LED backlit picture lightboxes and standard metallic or glossy prints, they will soon be offering 3D Laser Etched Art and Jewelry options as well. On the "About Us" page is an informative video that effectively places Earth into a universal perspective. The "Blogtoons" section, designed for both kids and adults alike, can really drive home astronomy concepts in a friendly and effective way! The ordering process is a breeze with smooth transitions between webpages as the order is processed and accepting Paypal payment as a great convenience. Whether or not a product is purchased from Stardust Gallery, it is well worth the website visit for the astronomy, entertainment, and humor content alone! Thanks, Tom. I added an in-line dimmer to the one Craig had me review. It uses PWM so doesn't affect color balance as the brightness is changed. I'm not sure, but I *think* Craig may now be including dimmers with the ones sold, but not positive on this. Thanks for sharing, Tom. Since you said that, I'm looking around at several things around the house where I have dimmers in line and not just the lightbox. I may now have to add simple fast blow fuses in line too based on your experience. Thanks, Hugh. I'm not sure about camera color balance settings, but whatever type of lighting you have in the room with the unit's backlight off (or even on) would change color balance. The room I'm sitting in here, for example, has traditional incandescent lighting, so the Milky Way on the wall has a yellowish tinge until I activate the backlight and then it's a lot more color balanced, but not fully because the incident incandescent lighting still pulls the spectrum a bit towards yellow. Thanks again, Tom. I think I may be on the lookout for different dimmers as I don't think any of the ones I'm using are UL approved. Good that you brought this up in case anyone wants to dim their lightbox.... or anything else for that matter! I get sick of reviews here that do not start with what the product cost. But I appreciate your time in doing the review. Nice. 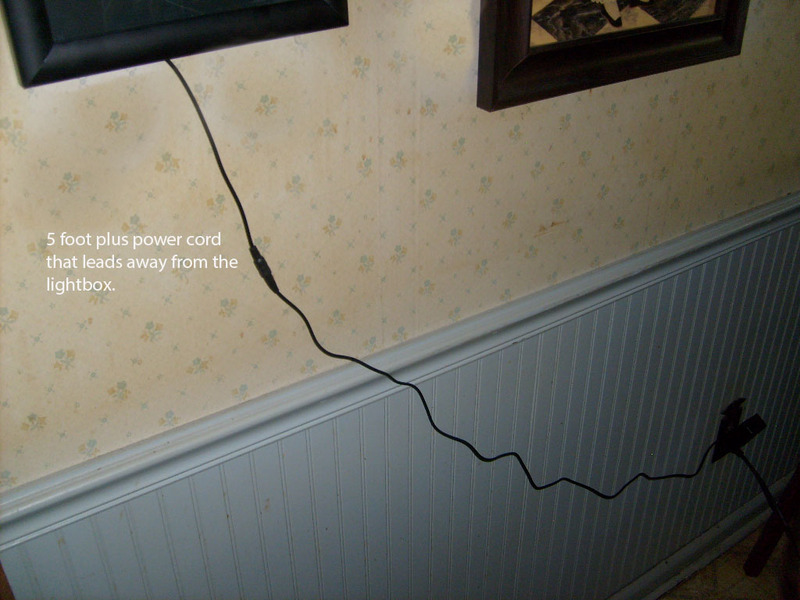 But I think I would provide some sort of hidden wiring like at the ceiling, hidden behind a decorative molding, then bring the power down from there in the wall to a connection. Good review. I always wanted to go this route with displaying my photos, unfortunately, the dangling wires simply "kills" it for me. LEDs are quite efficient. I think a battery powered solution would work well here. I couldn't imaging having a wall full of these with wires dangling all over the place. My wife and I had the good fortune of visiting the St. Regis Princeville Resort on Kauai, HI this past march. Inside the resort, is a photography gallery "AFeinberg". . .
One of their draws, is a large format LED Lightbox, which they place outside their entrance during business hours. 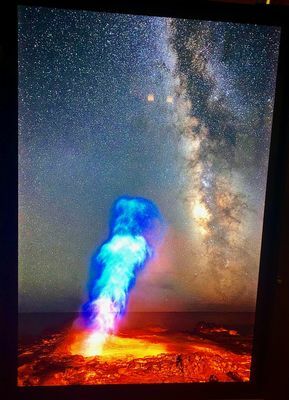 It's a very high res shot of a Gas plume, igniting over some Magma. In the background is a very well framed shot of the Milky Way. Definitely on the "bucket list" for the Man Cave. They are indeed nice. I have several from 11x13, 16x20, and even 24x48 sizes. All containing pictures I took. For the Milky Way on the wall, I wouldn't have it any other way! I have an actual negative light box that's battery powered with no cables...I would seriously look at this if it didn't have the ugly cords. I guess making battery powered ones are out of the question? I think it would depend on the current. There are a good many LED's inside of the frames. One could always take a current reading of frame amperage and go from there. Mine have arrived with anywhere from 3-6 amp 12 VDC power supplies and if the frame actually used that much, I think using one on battery would be difficult because a large battery won't fit into the frame. You can do that, but there's nothing like the 2x4 foot Milky Way illuminated lightbox on my wall. However, I do know someone close that does it with monitor, so whatever floats the boat. 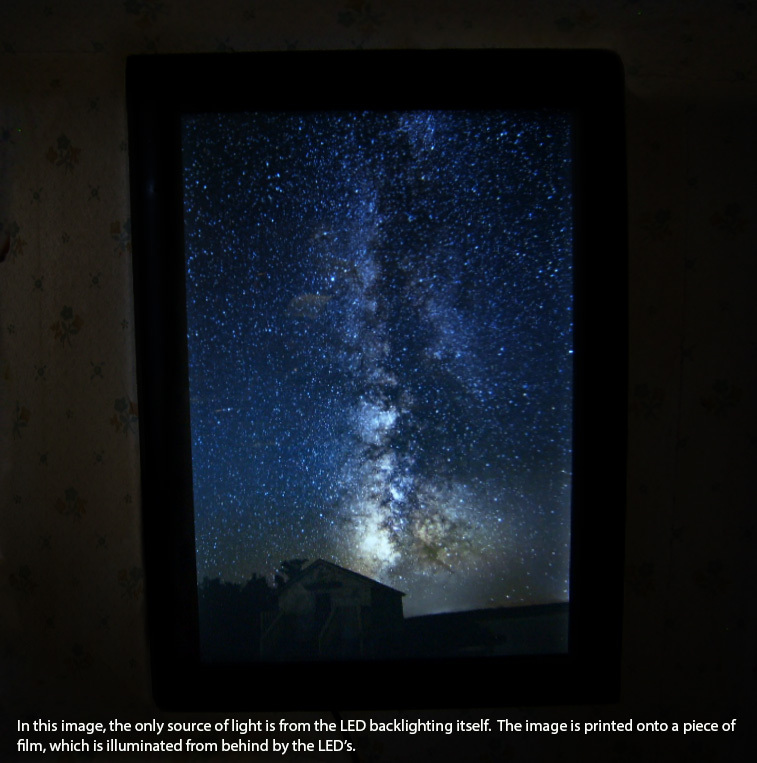 Sadly, it doesn't seem like lightboxes have taken off all that much, not just in the astro world but in general. I myself have five of them on the wall, two with astro and three with landscapes. I'd never go back to picture frames unless I used the strategically placed lights like in museums.